tle was a pad or frame worn under a skirt to support the fullness and drapery at the back of a woman’s skirt. Though the bustle had long occupied a place in a well-dressed woman’s wardrobe, it was clearly the article of clothing that was most vilified, especially by men. The bustle was also blamed for many women’s health problems, including squeezed or misplaced organs. Shopkeepers considered bustles a nuisance. Shops tended to be small and crowded and bustles were thought to take up too much space. Shopkeepers weren’t the only ones complaining about the size of bustles. An editorial in a Boston newspaper asked why there was no city ordinance prohibiting bustles from protruding more than a foot in length beyond the sidewalk. safe-deposit box to hide jewelry and other valuables from marauders. Bustles would be ripped apart and stuffed with treasures. It worked for a while. But then some soldiers noticed a marked increase in the size and proportions of women’s behinds and grew suspicious. The discovery resulted in the theft of many bustles. Bustles also caused an uproar with freight agents. Since it was cheaper to ship wire goods than dry goods, merchants listed bustles as wire goods. Freight agents argued that bustles were made from feathers and wool and had no wire. Merchants said that bustles superseded hoop skirts, which gave them every right to be billed as wire goods. This view eventually prevailed, but freight agents weren’t willing to give up so easily; they simply raised the cost of shipping wire goods. styles of bustles than herrings in a box.” The Washboard bustle was ribbed like a washboard. The bustle was considered a good deal for the merchant. For it was almost impossible to sit down without smashing the washboard, thus necessitating another trip to the store to replace it. There was also the Brooklyn Bridge bustle, also known as the suspension Bridge or Two-Story bustle. As the name suggested, this was a series of bustles that extended down to the knees. Another type of bustle was the Wind bustle, made of rubber. This included a rubber hose so that it could be inflated. This bustle was especially handy should a woman suddenly find herself in water, as it served double-duty as a life preserver. Some practical women would wear only bustles they made themselves out of newspapers. Mrs. Grover Cleveland is credited for unwittingly causing the demise of the bustle. The story goes that two Washington newspaper reporters had nothing to report during a hot July. So, they made up a story that President Cleveland’s wife had abandoned the bustle. According to newspaper reports, Mrs. Cleveland later visited a department store and asked to see their bustles. Supposedly, the merchant told her that since news broke that she had given up bustles, none had sold and had been moved to the basement. I will admit to scanning online sites every spring and fall to discover the latest fashions trends. My heroine Beth Wallin in Frontier Matchmaker Bride has a greater passion for fashion, even on the frontier of 1875 Washington Territory. Her go-to source, pictured on the cover of her story, is Godey’s Lady’s Book. Godey’s was the brainchild of Louis A. Godey, who saw the growing need for a magazine tailored specifically to the lady of the house. He hired a female editor, Sarah J. Hale, herself an author (often remembered for writing “Mary Had a Little Lamb”), who also ensured the rest of the staff was predominantly female. In fact, Godey boasted at having a corps of 150 female colorers who hand-tinted the fashion plates that started every issue. The early issues of Godey’s carried articles taken from British women’s magazines. The magazine even had its own reporter simply to chronicle royal activities across the Pond. Though Sarah Hale was purportedly a huge fan of Queen Victoria, she wanted more of an American angle for the magazine. She was also a staunch supporter of women’s rights, believing that women needed to be redeemed from their “inferior” position and placed as an equal helpmate to man in every way. She therefore commissioned articles, essays, stories, and poetry from American writers including Harriet Beecher Stowe and Frances Hodgson Burnett. Male luminaries Nathaniel Hawthorne, Ralph Waldo Emerson, Edgar Allen Poe, and Henry Wadsworth Longfellow also contributed. Articles covered health and science, crafts, dancing, horseback riding, home decorating, and recipes. Every issue included two pages of new sheet music for the pianoforte. And women paid for the privilege of reading it. Subscriptions ran three dollars a year when other popular magazines of the time were only two dollars. The magazine was delivered by post all over the United States, from the gilded mansions on Boston’s Beacon Hill to the rustic ranches of the Texas Hill Country and the log cabins of Seattle. Despite its broad coverage, Godey’s steered clear of politics. The Civil War was never mentioned in its pages. One source I consulted claimed that readership was cut by a third from its high of 150,000 subscribers during the war, implying that it was because of Godey’s non-political stance. I’m more inclined to believe that the magazine’s subscriptions fell during that time because women were counting pennies as husbands and fathers went off to war. Regardless, Godey’s popularity led it to become a major force in America. The magazine is credited with popularizing a white wedding gown (after Victoria wore one in England), the use of a Christmas tree to crown that celebration, and the creation of Thanksgiving as a national holiday. It even inspired Beth Wallin to create gowns far above those usually found on the frontier, thanks to a sister-in-law who is a seamstress and her own good taste. This is one of the gowns I pictured for her. So, do you consider yourself a fashionista? What’s your go-to source? 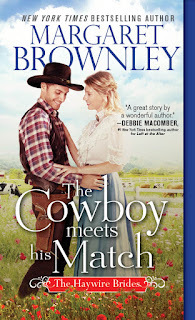 Answer in the comments to be entered into a drawing for an autographed copy of Beth’s story, Frontier Matchmaker Bride. Spunky Beth Wallin is determined to find a bride for Deputy Hart McCormick, the man who once spurned her affections. After tragically losing his sweetheart, Hart vowed never to love again. He might be Beth’s first matchmaking miss, unless they can both admit that she would be his perfect match. Regina Scott started writing novels in the third grade. Thankfully for literature as we know it, she didn’t actually sell her first Regency romance novel until she had learned a bit more about writing such as vocabulary, sentence structure, and plot. After numerous short stories and articles in magazines and trade journals, she got serious about her novel writing. The Regency romance The Unflappable Miss Fairchild was her first novel to be published (March 1998). In 2011, she was delighted to move into Christian romance with the publication of The Irresistible Earl. Her novels have been translated into Dutch, German, Italian, and Portuguese; and a large number have been issued in hardcover, large print editions. She has twice won the prestigious RT Book Reviews Reviewer’s Choice award for best historical Christian romance of its type, for The Heiress’s Homecoming in 2013 and Would-Be Wilderness Wife in 2015. Connect with her online at her website or sign up for her newsletter. er after dropping off our youngest son at college in New Jersey, we visited wineries on the return trip to break up the endless miles. Once home we discovered quite a few wineries in our area. Now I had a goal I could really get behind–visiting local wineries! I found Valley View, Texas because of a billboard advertising its local winery. What I never expected was to also find a Texas getaway gem in this town of seven hundred fifty-seven people. The minute I drove into Valley View, my tension drifted away with the warm Texas breeze, and that was even before I had a glass of Firelight Vineyard’s sangria! The town reminded me of my childhood spent at my grandparent’s farm in northeastern Iowa. There was open space, trees, horses and cows. Often all in one front yard. There life doesn’t speed by. Neighbors know each other. Everyone’s friendly and laid back. Whenever I’m there I run into someone who wants to talk. Whether it’s someone at the winery, a local business owner, or an Army/Air Force Veteran. Whenever I hear Josh Gallagher’s “Pick Any Small Town” Valley View’s the one I’d pick. w from years back and a wonderful couple from Oklahoma. Life was simpler, personal and connected. And I loved every minute of it. I remembered why I write stories set in small towns, because of the feelings I rediscovered in Valley View. Because of the way I felt at my grandparents’ farm and in their small town. the town square. Hmmm. It’s a start. Now it’s your turn. Tell me about your favorite getaway spot that rejuvenates your body and soul. Enter a comment for a chance to win the wine charms and a wineglass from FIrelight Vineyards. Hi everyone, Winnie Griggs here. First an apology – I’m just off of a series of all nighters as I worked to meet my deadline on my latest work in progress (which I made by a hair) and then a weekend of fun at a family reunion. So this post will be a bit shorter than normal. That being said, when I looked up Oct 10 on my National Day Of calendar, I noticed that in addition to it being Columbus Day this year, it is also National Handbag Day. So I thought it would be fun to share a little bit of handbag trivia with you and then share some pictures of some of my own handbags. In the 15th century it was traditional for a bridegroom to give his bride a purse with embroidered pictures of love stories. The average weight of a woman’s handbag is over 5 pounds. A Japanese designer created a handbag in 2008 that is wort more than $2 million. It was crafted of platinum and decorated with over 2,000 diamonds. So what about you? Do you have a large collection of handbags or just a few? Do you tend toward the large or the small, the designer bags or more utilitarian?